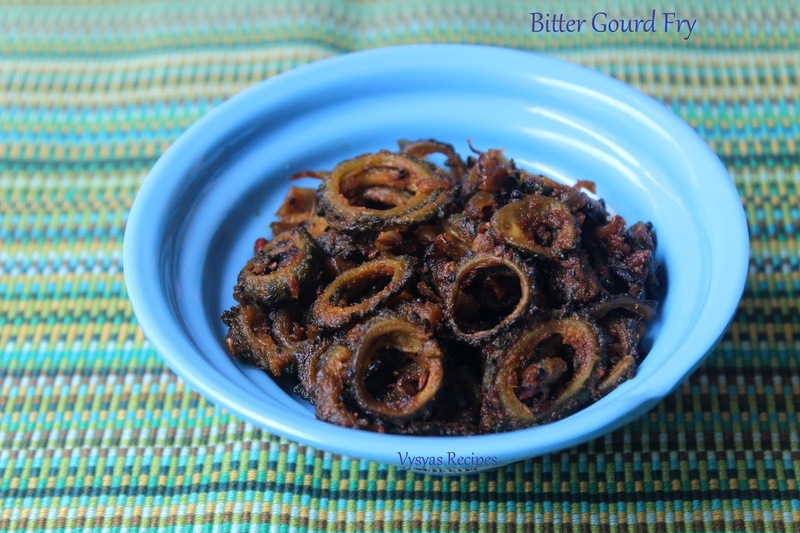 Bitter Guord Stir fry(Karela Sabzi) is a healthy & tasty Stir fry made with desseeded Bitter Guord Roundels, onions & spice powders. 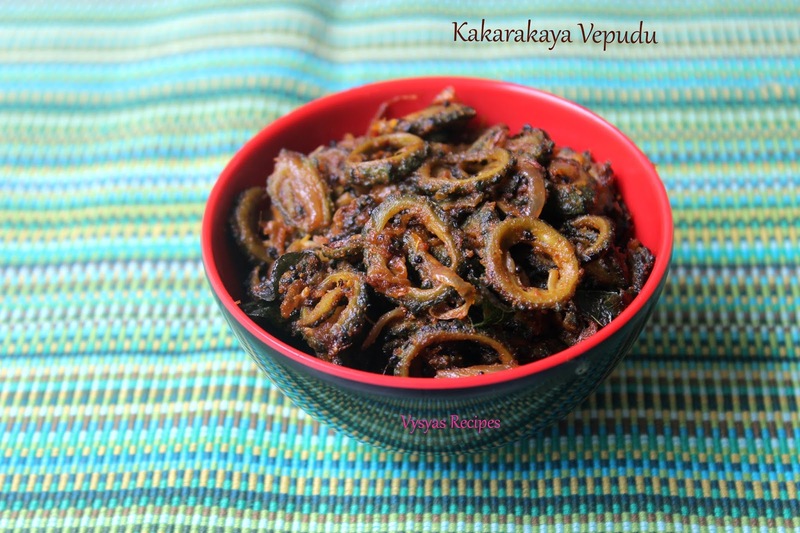 This kakarakaya vepudu Goes well with Sambar Rice,Rasam Rice Curd Rice,Chapathi's & Roti. I have added Extra Spice Powder & sugar to get rid of excess bitter taste from bitter Guord.Bitter gourd has multiple health benefits.It helps diabetic Patients to cure insulin resistance without taking any external medication.Karela Juice helps boost the immune system. Karela juice is an excellent natural antioxidant. Its essential elements in bitter guord are responsible to clean up toxins from blood. Bitter Gourd Chopped/kakarakaya - 4 cups. Onions - 2 (cut length wise). Wash the bitter Gourd, cut it into roundels & remove the seeds. Dry Roast everything given in "Roast & Grind" column & grind it into a fine powder. Heat the oil, add mustard seeds when it splutters add cumin seeds. When cumin seeds sizzles add curry leaves, then add bitter Gourd,turmeric & little salt. Saute in high flame for 2 minutes. Then keep the flame to low, cook it covered. Saute now & then. After 5- 6 minutes, add chilli powder,salt. mix well. Then add sugar give a quick mix. let it cook for another 5 minutes, then add ground Powder & needed salt(adjust salt).mix well. Add oil little by little & keep stirring until bitter Gourd turns deep brown colour & also gets cooked well. I have used baby bitter Gourd to make this curry. you can use bigger ones also. Deseeding the bitter Gourd & adding sugar will reduces the bitterness. Saute the onions, till it turns brown for Good taste. Adding Ground powder is optional, but it adds extra taste to the curry. Cook till it turns deep brown colour. if you feel still bitter, add lemon Juice while frying, then adjust the spiciness accordingly. Adjust the chilli powder according to your spice level. Never tried pavaikai this way... Yum. Love the way how you sliced the bitter gourd.